Real, fluke, or something in between: How good is Scott Diamond? I liked the Twins' decision to pluck Scott Diamond from the Braves' farm system in the Rule 5 draft, writing at the time that "he's had success at every level" and "may be able to find success in the big leagues without missing a ton of bats" because he "has done a tremendous job inducing ground balls and limiting homers" in the minors. That was December of 2010 and later that offseason I ranked Diamond as the 36th-best prospect in the Twins' farm system. I hated the Twins' decision to trade Billy Bullock to the Braves for Diamond to circumvent the stipulation that Rule 5 picks must remain in the majors all season or be offered back to their old team. 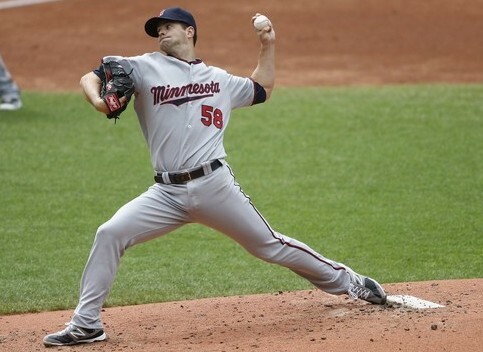 It seemed silly to give up Bullock, a hard-throwing reliever drafted in the second round and given a $533,000 bonus just a year earlier, when the Twins already had Diamond and could have retained him simply by keeping him on the roster as a long reliever at age 24. Diamond ended up spending nearly the entire second half of last year in the majors anyway, meaning the Twins basically traded Bullock for the ability to keep him in the minors for an extra three months. And in those three months Diamond had a 5.56 ERA at Triple-A, so it wasn't surprising when the left-hander struggled in his first taste of the big leagues with a 5.08 ERA and ugly 19-to-17 strikeout-to-walk ratio in 39 innings while allowing opponents to hit .317. Bullock had issues of his own following the trade with a 4.44 ERA and 34 walks in 51 innings at Double-A, but he still threw in the mid-90s and still racked up 11.7 strikeouts per nine innings while holding opponents to a .199 batting average. Bullock continued to look like a potential late-inning reliever, Diamond continued to look like a potential back-of-the-rotation starter, and the Twins' thought process behind the trade continued to make little sense to me. Despite making seven starts for the Twins down the stretch last season Diamond was never in the mix for an Opening Day roster spot this season, getting sent back to Triple-A as part of the first round of spring training cuts. He fared well in Rochester with a 2.60 ERA in six starts, but also allowed opponents to hit .270 and managed an unimpressive 26 strikeouts in 35 innings as a 25-year-old spending his third consecutive season at Triple-A. When injuries and ineffectiveness wrecked the Twins' rotation for a second straight year they again turned to Diamond, calling him up on May 5. In returning to the majors Diamond brought with him a 4.50 ERA in 39 total Triple-A starts, which along with his modest 6.3 strikeouts per nine innings there and the equally modest fastball velocity he showed in debuting last season seemingly provided little reason for optimism. And so naturally six weeks later Diamond has a 1.61 ERA through seven starts. Diamond faced 181 batters last year and has faced 183 batters this year, so while small the sample size is equal. He's gone from as many walks (17) as strikeouts (19) to a 28-to-4 ratio, increasing his strikeouts by 46 percent and decreasing his walks by 76 percent. He's allowed the same number of line drives and actually given up more homers, but Diamond's ground-ball rate went from neutral at 46 percent to among the league leaders at 62 percent. Diamond has gotten slightly more strikes, thrown slightly more pitches in the strike zone, and jumped ahead of batters with first-pitch strikes slightly more often, but all three of those rates are within a couple percentage points of last season and he's actually induced slightly fewer swings and slightly fewer misses than in 2011. Add it all up and Diamond's results are vastly improved, but his raw stuff and general approach haven't changed a ton. That could mean he's simply learned to make better pitches, which would obviously be a good thing, but it could also mean he's been fortunate that pitches thrown at roughly the same velocity and roughly the same frequency have created far better results. There's no doubt that Diamond has looked and pitched better, but exactly how much better and the sustainability of his improvement is an interesting question that will require more than 14 starts to answer. For now I'm cautiously optimistic that Diamond can be a solid third or fourth starter, although admittedly fifth starter was more likely based on his track record prior to rejoining the Twins last month. He throws strikes and keeps the ball on the ground, which is a great foundation for success, and if Diamond can maintain any kind of decent strikeout rate he could be part of the Twins' rotation for a long time. Or at least long enough to make everyone forget Bullock. Some trades seem like good moves, some trades seem like bad moves, and some trades seem like bad moves and don't make much sense. Yesterday's trade with the Braves to retain Rule 5 pick Scott Diamond unfortunately qualifies as the latter, as the Twins swapped a high-upside, hard-throwing reliever prospect in Billy Bullock for a low-90s throwing left-hander who wasn't even protected from the Rule 5 draft and projects as no more than a mid-rotation starter. In the wake of the deal there are reports about the Twins wanting Diamond so much that they nearly traded up in the Rule 5 draft to make sure they got him and reports about how they've since grown to like him even more this spring. And that's fine. I like Diamond too and when the Twins plucked him from the Braves in the Rule 5 draft four months ago I wrote about him being a nice low-cost pickup for the total investment of just $50,000 and a spot on the MLB roster. However, the Twins apparently didn't love Diamond enough to give him one the seven spots in their bullpen as a long reliever or mop-up man and because of that were forced to either offer him back to the Braves or work out a separate deal to keep him in the minors outside of the Rule 5 system. They chose to work something out with Atlanta, which is perfectly reasonable in theory, except "something" inexplicably turned out to be a far better prospect than Diamond. Bullock was the Twins' second-round pick in 2009 and the 6-foot-6, 230-pounder signed for a $533,000 bonus, posting a 3.18 ERA with 150 strikeouts in 108 innings through two seasons while advancing all the way to Double-A as a 22-year-old. He has control problems, but that comes with the mid-90s fastball that made the former University of Florida closer perhaps the hardest-thrower in a farm system perpetually loaded with potential mid-rotation starters. All offseason the Twins talked of wanting to acquire more big, hard-throwing strikeout pitchers with overpowering raw stuff, yet they traded arguably the best example of that in their entire organization for a mid-rotation starter they already controlled and could have kept for nothing by simply giving him a low-leverage job in a bullpen housing seven relievers. I'm dumbfounded by the move purely on a talent level, but even more so because of the Rule 5 aspect. Atlanta didn't even deem Diamond worthy of a 40-man roster spot to protect him from the Rule 5 draft in December and he lasted all the way to the Twins with the 27th selection, later going unclaimed on waivers this week, yet the Braves somehow just turned him into a power arm two years removed from being a second rounder. And all because the Twins weren't willing to trust Diamond with a long relief job that would've allowed them to keep him for nothing. I'm admittedly a bigger Bullock fan than most, viewing him as a potential future closer and the epitome of the type of high-upside arm the Twins should be trying to add while ranking him as the team's No. 10 prospect (whereas Diamond placed No. 36). But clearly I'm not alone, as the Twins liked Bullock enough to spend a second-round pick and $533,000 on him 20 months ago and Baseball America ranked him as the No. 15 prospect in the system, with Diamond at No. 29. You'll be hard-pressed to find anyone who values Diamond higher than Bullock. Except for the Twins, apparently. Yet if they love Diamond that much the Twins could have just stuck him in a low-leverage bullpen role like they did with Johan Santana in 2000. And if they don't love him enough to let Diamond fill one of the seven bullpen jobs at age 24 so they could retain him for nothing, then why trade a high-upside, consensus top-20 prospect for him? I just don't get it.